File Name: Brad J. Armbruster of Providence, Rhode Island. Notes: Providence, the state capital, is located at the mouth of the Providence River. Bullhorn, Dee-Jay, Dogfight, Ice Cream Soldier, Skystriker, and Major Storm also come from Providence. Hasbro's headquarters is in nearby Pawtucket, which is why so many Joes come from this state. The 1992 filecard uniquely identifies Ace as Wendall L. Armbruster of Seattle, WA. Notes: Wore an entirely different outfit from the original figure's: black hair, a regular white helmet with black airmask and blue goggles (worn only when flying), no red trim on the uniform, a dark grey vest, and normal-sized black boots. In Computer Complications, several generic Joe pilots wore outfits similar to Ace's. An early ad for Marvel comics gave Ace an outfit based on the 1983 version but colored green. In Valor vs. Venom, Ace spoke two lines from inside the cockpit of a Thunderwing but was not quite visible through the canopy. Accessories: white domed flight helmet with clear face shield (new). Ace would rather fly than do anything else. During high school he worked after school and weekends to pay for flying lessons. Spent one year flying pipelines in Alaska and two years stunt flying for movies. Enlisted USAF at age 22. Duty most previous to G.I. Joe assignment: senior instructor USAF Fighter Weapons Squadron "The Aggressors" (pilot combat training school). Qualified Expert: F-5E, F-15, F-16, XP-14/F. Ace has one major character flaw: cutthroat poker. A predilection for gambling would ordinarily disqualify an applicant for the G.I. Joe team but in Armbruster's case you can hardly call it gambling since he NEVER LOSES. That's why we call him Ace! Reissues: Reissued in mail offers 1988-1990 (North Atlantic, Operation Deep Six, Incredible Shrinking Joes). Accessories: machine pistol (88 Shockwave's), white soft-plastic flight helmet with large green goggles and posts for masks (new), black breath mask with straps and short air hose (new). ACE is the original fighter-jock jet driver of the G.I. Joe Team. He can push a twin-engine, air superiority fighter to the red-line, performing daring aerobatic maneuvers that other pilots would consider impossible. To Ace, taking an open-harness, high-powered craft into the heart of Cobra-controlled territory is the ultimate challenge of his flying skills! Ace is a graduate of the Combined Services Escape and Evasion School. Motto: "Flying a modern fly-by-wire jet is like flying a computer with wings. Piloting a Battle Copter into a fast-rising thermal with the control surfaces vibrating through your sticks and harness - that's flying!" Toy Notes: Item #6755. The figure pictured in the 1992 insert catalog and on the box back has a green breath mask. Accessories: black Uzi (86 Low-Light's), black helmet with olive goggles (92 Ace's), black mask (92 Ace's). ACE would rather fly than do anything else. During high school, he worked after school and weekends to pay for flying lessons. He spent one year flying pipelines in Alaska and two years stunt flying for movies before enlisting in the U.S. Air Force at 22. He joined the G.I. Joe team after serving in pilot combat training school as a senior instructor to the U.S.A.F. 's Fighter Weapons Squadron (known to most aviators as "The Aggressors"). He's an expert pilot qualified to fly an F-5E, F-16, XP-14/F, and the Ghoststriker X-16 jet. He has one major character flaw: cutthroat poker. But in Armbruster's case, you can hardly call it a flaw because he NEVER LOSES! That's why he's called ACE! Motto: "Once an enemy is in my sights, I blast 'em from the sky then turn 'n burn back home!" Toy Notes: Item #6868. Referred to in the Ghoststriker commercial as a "special-edition Ace." Accessories: all-brown hard-plastic helmet (92 Ace's), stiff black mask (92 Ace's), black figure stand (common). Ace would rather fly than do anything else. He's a legend in the sky with an outstanding mission record. Ace joined the G.I. Joe team after serving as a Senior Instructor for the U.S.A.F. 's Fighter weapons squadron (a.k.a. the "Aggressors"). Put him in the cockpit of any high-powered craft, and he'll be performing daring aerobatic maneuvers that other pilots would consider impossible. Suffice it to say, he's an expert - qualified to fly the F-5E, F-16, XP-14F, and Ghost Striker X-16 jet. He thought he had reached the top, until the chance to fly low-level ground attacks presented itself. Flying the A-10 Ground Attack jet introduced him to a whole new area, and Ace was ready for the challenge. Gliding just above the trees for a bombing run on a COBRA outpost is almost as fun as winning five straight hands at his favorite card game, poker. Gambling would ordinarily disqualify any applicant from the team, but since he NEVER loses, it isn't really gambling. From General Hawk's File: "Ace is a fast thinker with great judgment. His knowledge of air-combat and dog-fighting skills is extraordinary. A man you can trust anytime except at the card table. He has what it takes to accomplish the mission and bring himself and the aircraft home in one piece. If I didn't trust his skill, I wouldn't ride along with him." Motto: "You only get one shot at me. When it's my turn, you'll crash and burn." Toy Notes: Boxed as a Toys 'R Us-exclusive with Gen. Hawk and a recolor of the Rattler. Item #28019. The vehicle is considered a moderately high-demand item. Accessories: grey helmet with clear face shield (83 Ace's), black figure stand (common). Ace would rather fly than do anything else. He's a legend in the sky with an outstanding mission record. He joined the G.I. Joe team after serving as a senior instructor for the USAF's Fighter weapons squadron (known as the "Aggressors"). Put him in the cockpit of any high-powered craft and he'll be performing daring aerobatic maneuvers that other pilots would consider impossible. Suffice it to say, he's an expert - qualified to fly the F-5E, F-14, and F-16 fighter jets. Always looking for the thrill of higher, faster, better - the CONQUEST X-30 was exactly the challenge he had been looking for. His highly sensitive computer controls compliments [sic] his fast reflexes and target acquisition capabilities. COBRA pilots know, once he's on their six, it's all over for them. His only major character flaw is cut-throat poker. Gambling would ordinarily disqualify any applicant from the team, but since he NEVER loses, it can't really be called gambling. From General Hawk's Files: "Ace is a fast thinker with great judgment. His knowledge of air-combat and dog-fighting skills is extraordinary A man you can trust anytime except at the card table. He has what it takes to accomplish the mission and bring himself and the aircraft home in one piece. If I didn't trust his skill, I wouldn't ride along with him." Toy Notes: Boxed as a Toys 'R Us-exclusive. Item #57062. Tigerhawk/Thunderwing Accessories: grey flight helmet with black raised goggles and dark grey air tube (new). 2005 Single-Pack Accessories: black pistol (88 Shockwave's), black rifle (86 Leatherneck's), grey helmet with black goggles and dark grey air tube (04 Ace's), black backpack (92 Gung-Ho's). The United States military maintains a powerful presence in the skies. As a member of the Air Force Tactical Air Command, ACE provides aerial support as a fighter pilot. He goes on combat missions and reconnaissance operations, guiding his fast, highly maneuverable fighter over hostile territory with skill and precision. ACE has loved flying all his life and learned to fly while he was still in high school. He joined the Air Force and is more at home in the cockpit than anywhere else. He is always ready at a moment's notice to take to the skies and strike the evil COBRA forces whenever they launch another criminal attack. "When the enemy is in my sights, he can't run or hide because I'll get him, and clip his wings for good!" Toy Notes: Item #58160. An Ace figure was intended for release with 2005's Heavy Assault Squad, which contains a VvV-style Ace filecard whose wording is identical to this one. Reissues: Also boxed in August 2004 with some Toys 'R Us-exclusive copies of the Thunderwing with Slip Stream. Reissued in the April 2005 Wave 3 discount figure single-pack assortment (Item #06115), and without accessories in the July 2008 Wave 4 discount figure single-pack assortment (Item #35371). Accessories: tan helmet with black goggles and dark grey air tube (04 Ace's). 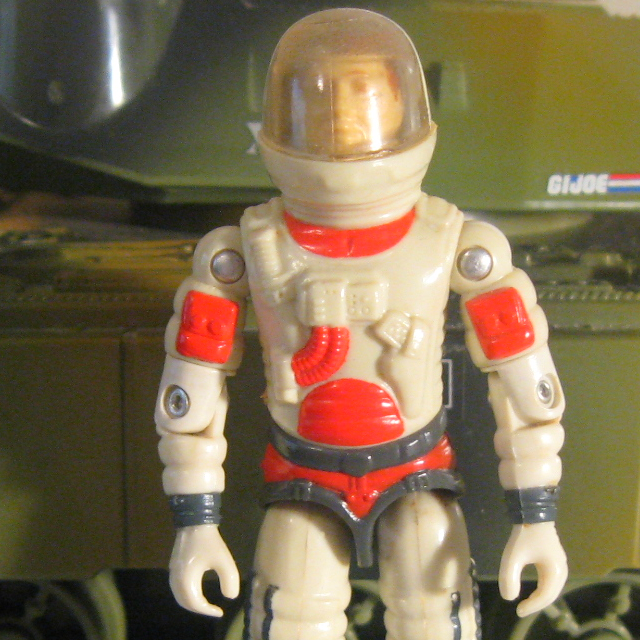 Accessories: white domed flight helmet with clear face shield (new), white half-vest with red collar and grey straps (new), black Joe figure stand. CAPT. ACE would rather fly than do anything else. During high school, he worked after school and weekends to pay for flying lessons. He spent one year flying pipelines in Alaska and two years stunt flying for movies before enlisting in the USAF. He joined the G.I. JOE team after serving in pilot combat training school as a senior instructor. He's right at home in the cockpit of all types of planes and has an intuitive knack for getting the most of them. "CAPT. ACE has one major character flaw: cutthroat poker. A predilection for gambling would ordinarily disqualify an applicant for the G.I. JOE team, but in Armbruster's case you can hardly call it gambling since he NEVER LOSES. That's why we call him CAPT. ACE." Toy Notes: Carded in a two-pack with Wild Weasel and a reprint of Marvel #115. Item #29340. Accessories: black pistol (06 Med Alert's), green soft-plastic flight helmet with black goggles and attached mic (new), black Joe figure stand. Toy Notes: Boxed in a Toys 'R Us-exclusive three-pack with Wild Bill and Skyduster. Item #36144, set 1 of 3.